Papersafe supplied four photographers with a unique, hand-built Swordfish Camera and one month’s supply of Fujifilm FP100c peel-apart film. The idea was to provide each photographer (Jordanna Kalman, Josie Keefe, Molly Matalon, and Michael Christopher McCraw) with the means and material to continue on-going projects, experiment in the studio, or create entirely new work. The selected photographers all produced images that reveal the personal and investigative way they used the camera—looking through their work from this project is akin to briefly peering into their lives and glimpsing their creative process. Papersafe also commissioned three essays on instant photography. These writings—by Brooke Mazurek & Paige Mazurek, Darren Lee Miller, and Millee Tibbs—reflect upon, consider, and question the role of the instant print with regard to memory and nostalgia, while also examining its place in the history of photography and popular culture. 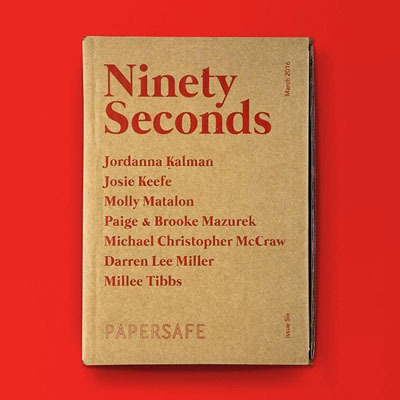 Ninety Seconds comes as box set that includes one booklet of essays, four booklets of photographs (one for each photographer), and a postcard print—all housed in a custom screen printed box. Designed and edited by Trevor Powers. CLICK HERE TO VIEW / DOWNLOAD THE ESSAY BY DARREN LEE MILLER (includes introduction by publisher, Omer Hecht).